Preheat oven to 350°F. Spray 11/2-quart baking dish with nonstick cooking spray. Coat large skillet with cooking spray; heat over medium heat. Add onion, celery, and bell pepper; cook and stir until crisp-tender. Stir in soup and sour cream. 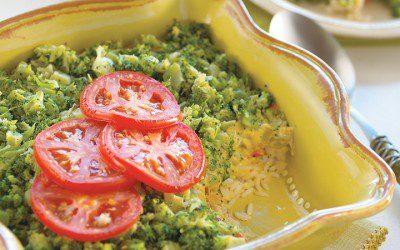 Layer rice and broccoli in prepared baking dish. Top evenly with soup mixture. Bake, covered, 20 minutes. Top with tomato slices. Bake, uncovered, 10 minutes. Serving size: 1/6 of total recipe. Exchanges per serving: 1 Bread/Starch, 1 Fat, 1 Vegetable.